“Eat, drink and be merry for tomorrow we die,” this ancient gladiator quote seems oddly fitting to recall on the eve of the most contentious and, let’s face it, depressing U.S. presidential election in recent memory. This year, voters will have the privilege of choosing between a candidate with so many skeletons in her closet that she can’t even close the door (and must therefore resort to borrowing outfits from 90’s hip-hop legends), or a candidate that is the best at everything…including racism. Personally, I will be writing in my vote. Instead of Trump/Pence or Clinton/Can’trememberhisname, I’ll be throwing my weight behind the Harrison Ford’s character in Air Force One/Bill Pullman’s character in Independence Day ticket. Unless there’s a sudden groundswell in support for early ’90s fictional presidents my plan will most likely fail and I, like most Americans, will find myself looking for a way to escape this reality all together. That’s where VR comes in. UploadVR encourages everyone to get out and vote tomorrow and, after you do, here are five VR worlds you can dive into that are way more fun than this one. You know how when you’re really angry at someone they tell you to write them a scathing letter that you never actually send? Well rather than preparing for Civil War (and not the fun Robert Downey Jr. kind), why not take out some of that election day-stress in smashing VR style? 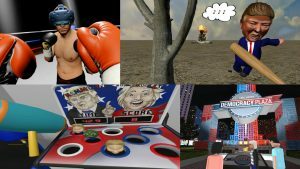 Whack-a-Vote: Hammering the Polls is a hilarious little VR experience for the HTC Vive created by the indie group Subreality Studios. By releasing your political frustrations with a mallet rather than a musket, hopefully we can try to avoid a repeat of the whole “bloodiest conflict in American history” thing. Plus: fun lights and sounds! Forget emails, incriminating recordings, and hidden tax returns, the biggest question of this election has always been: is Donald Trump actually full of candy and toys? Well, here’s your chance to find out. TrumPiñata is exactly what it sounds like. It’s Donald Trump but he’s a piñata now. You hit him with a stick and candy falls out. The event kicks off tomorrow at 6 pm PT. One of the most politically charged issues this campaign has been gun control. Some have argued that having more mass shootings than days of the year indicates that our nation’s attitude toward the availability of firearms needs to change. Others believe that McDonald’s should start including Lugers in its Happy Meals. No matter how you feel about real guns, there’s no denying that firing virtual weapons can be immensely therapeutic. Hot Dogs, Horseshoes and Hand Grenades has dozens of digital weapons for you to blast away the panic with. Plus there’s the added bonus of ensuring you know how to operate a firearm before we collapse into a Thunderdome-esque wasteland. Always be prepared. When I was a kid and my brother wouldn’t let me play Zelda (even though it was clearly my turn according to the chart Mom made), I’d often resort to the time-tested tradition of beating my pillow to a pulp. That way, my puny pre-pubescent punches would only be harming a cushion rather than the face of a loved one. Why not embrace a similar philosophy for election night? Thrill of The Fight is a VR boxing experience that will let you target your primal rage toward a digital opponent rather than something valuable like your television. Plus, it will also leave you far too exhausted at the end to be concerned with small issues like the increasingly tenuous transfer of power for a nation that is allowed to exist only as long as the people peacefully accept the outcomes of an open election….oh boy. Might be time for another round. Jokes aside, Please do get out and vote tomorrow. You can find your polling location here and let us know in the comments below what VR experiences you’ll be indulging in tomorrow. Go America! Freedom!